Tri-Lift NC Inc builds a new state of the art facility in Garner North Carolina. Tri-Lift NC distributes CLARK, BYD and SANY Forklifts. 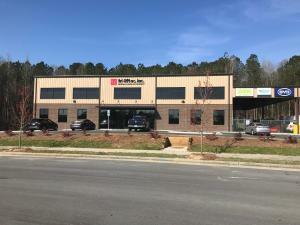 RALEIGH, NORTH CAROLINA, UNITED STATES, April 4, 2019 /EINPresswire.com/ -- Since 1968, Tri-Lift NC, has served the Carolinas and they are now proud to announce that the new full-service material handling facility in Garner NC is now open and ready for business! Our 13,000 square-foot, state-of-the-art facility is located in the Raleigh market close to I-40, with easy access to I-95 and the Eastern North Carolina region. This strategic location is significant in that it gives Tri-Lift NC a permanent presence in Garner and it allows Tri-Lift NC to service the entire Eastern North Carolina market with a guaranteed response time of 4 hours or less. Tri-Lift NC Inc is a multi-year recipient of the Dealer of Excellence Award for CLARK forklifts. Tri-Lift NC Inc also exclusively represents the BYD and SANY Forklift lines for all of North Carolina, South Carolina and Virginia. The new full service facility in Garner North Carolina has a dedicated parts warehouse, overhead crane, equipment wash bay and in-house staff to support the explosive growth in the Eastern North Carolina market. There is even a dedicated forklift operator training department and on-site training facility to provide safety training to new customers. The new facility’s forklift service department has factory trained and certified forklift technicians as well as fully equipped service vans for full-service mobile forklift service and repair. To meet the forklift and material handling equipment rental needs in Eastern North Carolina, Tri-Lift NC has a large forklift rental fleet ready to go, including access to the entire company’s rental fleet with numerous long-term rental and short-term rental programs to meet your needs. 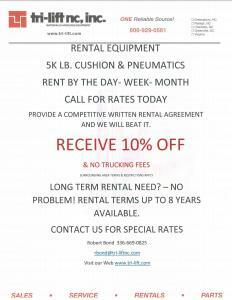 Rental terms range from daily, weekly, monthly and even yearly. To Celebrate the opening of the new facility, Tri-Lift is offering to beat any competitive rental invoice rate by at least 10%, some terms apply.